Facebook recently announced changes aimed at showing more news content in place of fuzzy cat pics, so you may notice an increase in the number of shared articles, lists and videos going forward. My newsfeed is overflowing. Sometimes the headline of a shared article is so obviously optimized for click bait, it makes me want to kick my naïve social network community. Most people are neither reading nor critically analyzing content before slapping on their stamp of approval by sharing the link. I prefer to call this the content curator fallacy. Luckily for us, we have companies moving forward with more meaningful metrics. Upworthy announced a new metric they will be using to measure the success of their shared content—attention minutes. Is this going to be a new standardized metric for content marketing? It’s exactly what it sounds like—the amount of minutes recorded actually spent engaging in the content. Upworthy is fashioning available metrics into figures that actually show how much of time is spent absorbing the material. Attention minutes are calculated using “signals” such as the movement of the mouse on a screen or the length a video player is open. Page views can be bought. Engagement can’t. 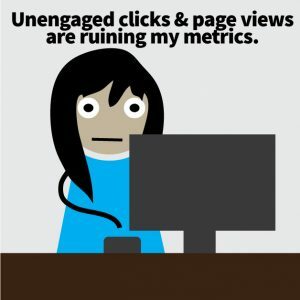 Web page analytics measure amount of clicks, bounce rates and masses of other metrics that may send your head spinning. How do you measure how well your content is really doing? Ask yourself if the amount of clicks amount to the value that you attribute to your page. Real value comes from user satisfaction—leaving the page feeling educated with new information, entertained, longing for more similar content. Inactivity. An open browser doesn’t mean the user is currently reading the material. Time on page is not an accurate portrayal of engagement. Unique users. Analytics may measure different users on the same device or the same user on different devices. Internal promotion. Are you sure the page views you’re getting aren’t just from a worker in your own company? I’m ecstatic about this movement towards more telling metrics. We can’t change the way our audience scrolls through the page, but we CAN change the quality of our content. Knowing how much time readers actually spend with the content will be a valuable addition to reporting and drive creators to take more pride in the quality of what they are producing. The great news? Upworthy says that it will be releasing the source code to the public in coming months.